Responsible Use Agreement (RUA): The Responsible Use Agreement details Parent responsibilities and Student responsibilities concerning proper use of the Chromebook. Optional TigerCare Program Agreement: The optional TigerCare Program offers families the opportunity to participate in a cooperative damage/loss program. The program is designed to protect students and families in the event the loaned Chromebook is lost, stolen or accidentally damaged. Participation in the TigerCare Program is voluntary. Families must decide whether to participate or not and indicate accordingly. Participation in the program is $20. Families that participate receive 75% reduction in repair and replacement costs as described in the agreement. Don’t delay, for students to receive a Chromebook on October 16, 2018, distribution day, completed agreements and participation fee for TigerCare Program, if family chooses to participate, must be received no later than October 15, 2018. What will be the One-to-One Chromebook I will be receiving? Each student included in the One-to-One deployment will receive a Chromebook. Chromebooks currently being used in Grades 5 – 12 will be distributed to students in grades 5, 6, 7, 10, 11 and 12. Newly purchased Chromebooks will be distributed to Students in grades 7, 8 and 9 (7th grade will receive some used and some new Chromebooks). New Chromebooks will be distributed to each 5th and 9th grade class each year, exception being 2019/2020 9th grade. Specifically, where and when will high school and middle students get their Chromebooks? The FPS Chromebook Full Agreement (includes Chromebook Loan Agreement, Responsible Use Agreement for Parents/Guardians and Students and Chromebook TigerCare Agreement) must be signed by Parent/Guardian and student before Chromebook will be assigned to student. Chromebooks will be handed out to 7th – 12th Grades on October 16, 2018 for all students with completed agreements. Chromebooks will be handed out in Enrichment at FMS and in TST at FHS. Why didn’t I get a Chromebook on Chromebook distribution day? Students and Parents/Guardians who did not complete the FPS Chromebook Full Agreement (includes Chromebook Loan Agreement, Responsible Use Agreement for Parents/Guardians and Students and Chromebook TigerCare Agreement) prior to the day of deployment will not receive a Chromebook. If I did not get a Chromebook on the distribution day, what do I need to do to get my Chromebook? A student who does not receive a Chromebook on deployment day will need to work with their parent or guardian to complete the FPS Chromebook Full Agreement (includes Chromebook Loan Agreement, Responsible Use Agreement for Parents/Guardians and Students and Chromebook TigerCare Agreement). Please seek assistance in the building Office. Will I receive a new Chromebook each year? No. Students will receive a Chromebook when they enter fifth grade, to be used through eighth grade, and ninth grade, to be used through their senior year. It will take the district a few years for the 5th and 9th grade cycles to be fully implemented. Will I need to turn in my Chromebook during the summer? Students in 5th and 6th grade do not take Chromebooks home. Students in 7th through 11th grade who will be returning in the fall will keep their Chromebooks during the summer. Students will return the Chromebook to the district at the end of their Senior year or when transferring out of the district. Who can use my Chromebook? Each Chromebook is labeled and assigned to an individual student and only that person can login to the Chromebook. Do not let friends or family borrow the Chromebook. May I personalize my Chromebook? Students may not personalize or embellish the Chromebook in a permanent way (eg: normal stickers, permanent markers, engraving, etc). Students may purchase a Hard Shell Case for the Chromebook if they choose. Cases are not provided or sold by the District. Students are not required to purchase a Hard Shell case. Why is it important to keep my login credentials/password a secret? Students should never share login credentials/passwords. Login credentials can be used to access more than just the Chromebook, sharing login credentials exposes the student to privacy concerns. What do I do if I suspect my login credentials or password changed or if they are no longer secret? Immediately seek assistance from a building technology contact to request a password change. Explain why the password change is needed. Will I have a place to leave my Chromebook at school overnight, over the weekend, or during breaks? Students in 7th through 12th grade need to take the Chromebook home. Students are expected to bring a fully charged Chromebook back to school each day. Will I need my Chromebook everyday? If yes, what if I forget to bring it? Yes, students are expected to have their Chromebooks with them everyday and fully charged. If students forget to charge or bring their Chromebook, temporary Chromebooks or power adapters will not be provided. How do I secure my Chromebook while at school (i.e. lunch, gym, etc)? Students should treat Chromebooks like any other valuables they bring to school. Please keep the Chromebook in your possession when possible and do not leave unattended. If you are in a class that leaves for lunch or another activity, check with the teacher to make sure the classroom will be secure. When available, secure the Chromebook in a locker. Never share your locker combinations with friends. What happens if my Chromebook is lost or stolen? Immediately contact a building administrator who will submit a Technology Work Request. In the event the Chromebook is reported LOST or STOLEN Fremont Public Schools will require the student/parent to file a police report and submit a copy to the District. What happens if I lose my power adapter? Immediately seek assistance from the office or a building technology contact to request a replacement. Replacement power adapters must be purchased from the district. Power adapters are not included in the TigerCare Program. What do I do if my Chromebook is not working properly? What are the potential repair or replacement fees associated with the Chromebook? Please see the Chromebook repair fee document HERE. Will TigerCare cover the expenses for the repair when gross negligence is involved? No, if a Chromebook is damaged due to gross negligence the expenses for repair will be charged at full value to the student. How do I get technical support when school is not in session (e.g. evenings, weekends, and breaks)? Support is available during normal school hours, seek assistance from a building technology contact who will submit a work request. What if I must have to access my Google Drive and I do not have an Internet connection? Fremont Public Schools only provides Internet access for students while at school. 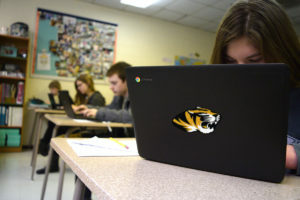 Options for students without Internet access at home include downloading files onto their Chromebook before leaving school, utilizing your school’s extended library hours, or connecting to public wifi (e.g., public library). What happens if I decide to leave the Fremont Public Schools district? If a student leaves the Fremont Public Schools district, the Chromebook and power adapter will be collected as part of the school’s formal checkout/withdrawal process. Can I purchase the Chromebook when my child graduates from FPS? When these Chromebooks reach the end of their deployment cycle (4 years) they will be repurposed by the District. Chromebooks will not be available for purchase by students. Can students choose not to participate in the One-to-One deployment? Yes, but it is not recommended. Please be warned that teachers will be teaching utilizing software and systems optimized for a One-to-One learning environment and your child may be at a disadvantage by having limited access. If students choose not to participate, can they bring their own computers to school? No, since we are providing each student with a Chromebook it is not necessary for students to bring their own devices. License agreements do not allow the District to load software on personal computers/Chromebooks. To protect instructional bandwidth and network security we limit/restrict outside computers/Chromebooks. Is content filtered on the Chromebooks when they are connected to the Internet? Yes, each Chromebook is filtered for inappropriate content and always passes through an internet filter when connected to the Internet no matter the location (e.g., school, home, public wifi). What if my student does not have Internet access at home?